70717 VALNPL1366.jpg 500X638\VALNPL1366.jpg Send A Hint! Show your Valentine how much you care with this red kalanchoe in embossed cement pot. This gift is the epitome of Valentine's red. The red blooms of the kalanchoe plant are complemented by the red non-woven sheet, and the red pattern on the cement pot. 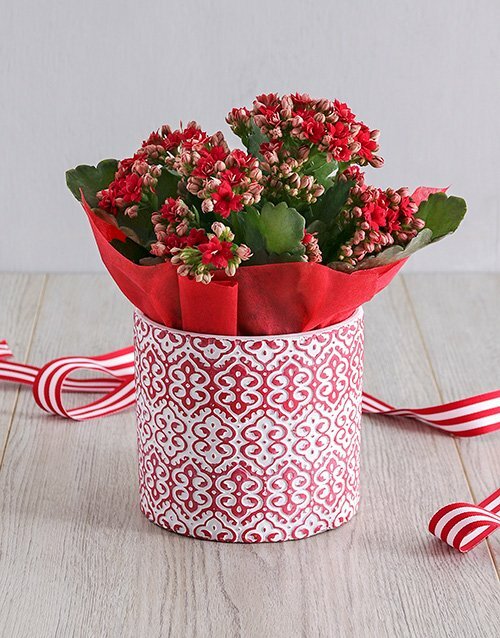 Get this Red Kalanchoe In Embossed Cement Pot delivered with NetFlorist.